Naturally kayakers spend a lot of time studying the relative merits of various boats, but they can't go anywhere without high-quality paddles. The paddle gives your abs, shoulders, and arms a finned extension, translating your muscle-power into smooth, swift momentum on the water. Check out the Paddlers Cove collection right here! Whatever your body size and type, whatever sort of kayaking or canoeing you do, Paddlers Cove has the perfect paddle for you somewhere in our inventory. You'll find the full array here, divided into several categories: canoe, recreational, touring, stand-up paddles, and whitewater. The paddle is your primary tool to get around. It is what gets you from point A to point B and will effect how long it takes to get there. There are many varieties of paddles with many different sub categories as well. Each paddle has a use with a certain type of boat. There's also a page devoted to our paddle accessories: leashes, drip rings, reflectors, and the like. You'll find paddles and accessories rendered by the best manufacturers in the world, such as Carlisle, Accent, Harmony, Adventure Technology, and Hobie. Browsing through the Paddlers Cove selection gives you an appreciation for the wide variety of paddle designs and styles. What sort of paddle you choose relates to your skill level, your physical abilities, and the type of boating you mostly pursue. You want to consider characteristics such as shaft and blade material (like wood, Kevlar, fiberglass, carbon, and injected plastic), which help determine the paddle's weight and durability, as well as shaft diameter, total paddle length, and the size and shape of the blade. Key into the blades, which come in a number of different forms. For one thing, they may be feathered: that is, set at opposite angles to one another. The feathered design means that when the submerged blade is fully gripping the water, the aloft one is offering as little resistance as possible as it slices through the air. Feathered paddles are great for windy conditions and long-distance treks--they're favored by sea kayakers, for example--but they certainly aren't essential for many paddlers. 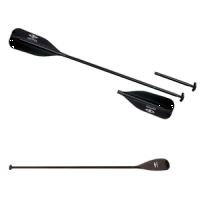 While the blades of canoe and some kayak paddles are flat, many kayak paddle blades are dished or spooned for a tighter, more stable water grip; therefore, unlike flat blades, they're unidirectional, with a clear front and rear. The outline of the blade may be symmetrical or asymmetrical, the latter being typical for kayak paddles. In terms of blade size, larger ones naturally grab more water but smaller ones give you a faster paddling rate. As mentioned above, factors such as paddle weight and blade size are particularly worth considering in relation to your own dimensions and physical abilities. You want a paddle you can wield comfortably, remember. A paddle with broad blades and a stiff material can translate to more power, but smaller kayakers might consider models with more compact blades and greater flexibility for less water resistance. The color of your paddle is, of course, a matter of personal preference. For sea-kayaking or crowded waterways, remember that bright and bold colors make you more visible to boats and fellow paddlers. Be sure to peruse the accessories we stock, as well. Drip rings, for example, can make your kayaking experience all the more pleasant by reducing the amount of water streaming down the paddle onto your hands. The Paddlers Cove staff boasts years and years of collective experience on rivers, lakes, bays, and open ocean. We're happy to offer counsel and help steer you toward a paddle that matches your needs exquisitely--whether you're a wilderness canoeist, a whitewater kayaker, or a laidback paddle-boarder.